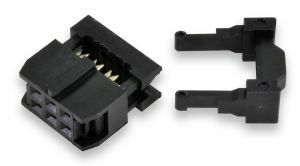 Various methods may be used to crimp the ribbon cable into the IDC connector. A variety of dedicated tools are available, covering an array of volume and budgetary priorities. For those who prefer not to purchase dedicated tooling, a small bench vise or arbor press may be used to reliably crimp the connector onto the cable.